Those 4 glorious words that every baseball fan has been waiting to hear since a Kris Bryant to Anthony Rizzo groundball putout ended a thrilling World Series game 7 and sent shockwaves across the planet as the Chicago Cubs ended a 108 year championship drought by defeating the Cleveland Indians 8-7 in extra innings. Now as Spring Training is upon us the 2017 NY Yankees hope to use the same formula from the World Champion Cubs’ recipe for success and build a championship caliber team by committing to a total youth movement. The Yankees have done an excellent job in acquiring or drafting top flight talent the past few seasons: Clint Frazier, Acq. via trade with Cle. ; Gleyber Torres, Acq via trade with Cubs; Justus Sheffield , Acq via trade with Cle; Aaron Judge drafted 1st rd 2013; Blake Rutherford, drafted 1st rd in 2016. One thing for sure is that Judge must cut down on his strikeouts (42 in 84 big league at-bats) to have any chance of winning a roster spot come April. One battle that Yankee fans have been looking forward to but unfortunately won’t see happen was the competition for the first base job between Greg Bird, who missed the entire 2016 season due to a torn labrum, and rookie sensation Tyler Austin. Austin, while taking batting practice earlier this week, fouled a ball off his left foot and x-rays and an MRI revealed a small break in a bone in that foot and as a result will be out at least 6 weeks. 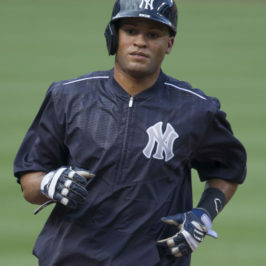 Therefore, assuming Bird is fully recovered and remains healthy through spring training, he will be the Opening Day starter with the newly signed Chris Carter who is coming off a National League leading 41 bombs entrenched as his backup. Along the pitching front there will be heavy competition as several players will be lobbying for the number 4 and 5 spots in the Yankee rotation behind Masahiro Tanaka, C.C. Sabathia, and Michael Pineda. Candidates include Luis Severino, Chad Green, Luis Cessa, Bryan Mitchell, Adam Warren and just signed Jon Niese who brings experience as both a starter and possible longman out of the bullpen from the left side. Also looking to make some noise this spring is 6’6 lefty Jordan Montgomery. The 24 year old is coming off a brilliant season starting at Double A Trenton and finishing at Triple A Scranton/Wilkes Barre. Combined he went 14-5 with a 2.13 E.R.A and a 1.20 WHIP with 134 strikeouts in 139 plus innings to emerge as a serious candidate for a rotation spot. As I wrote in my Prospects 1500 top 50 prospects in January, Montgomery is not overpowering but keeps hitters off balance with a smooth delivery and has 4 pitches that he locates and mixes very well. With a good spring, he might have the best chance of any non-roster player to earn a spot. Out of the ‘pen keep your eye on a hard throwing 24 year old named J.P. Feyereisen. Feyereisen was the lesser known player in the trade of Andrew Miller to Cleveland in which the Yankees received head-lining prospects Clint Frazier and Justus Sheffield. With Akron, Cleveland’s Double A team, and Double A Trenton, Feyereisen pitched to a 1.70 E.R.A with a 1.10 WHIP, struckout 78 in 58.1 innings, and for good measure pitched in 10 games in the Arizona Fall League finishing with a 2,57 E.R.A with 18 K in 14 IP. He’s got a live arm that has hit triple digits with his fastball and consistently sits in the mid 90’s and a nasty late breaking slider he’s developing as his knockout pitch. He’s had experience closing games in the minors, so he could possibly be a late inning option for Joe Girardi or, at the very least, a candidate for a middle relief role. As Spring Training starts picking up steam and moving forward there will be tough decisions for Girardi and his coaching staff to sort through as they try to blend some veterans in with the incredible young talent on display to arrive at the Opening Day 25 man roster. Throw in Special Advisor Alex Rodriguez and the newly retired, ultra charismatic Nick Swisher as guest instructors and the Yankees camp will be buzzing all spring with storylines. So buckle up, come along for the ride, and stay tuned to Prospects1500 as I will be posting updates throughout Spring Training on what’s happening down in Tampa. And as always I would love to hear from you so drop me a comment to let me know what you’re thinking.